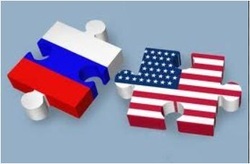 UNITED STATES RUSSIAN MERGER: A Done Deal? In 42 B.C. Cicero said "A nation can survive its fools, and even the ambitious. But it cannot survive treason from within. An enemy at the gates is less formidable, for he is known and he carries his banners openly. But the traitor moves among those within the gate freely, his sly whispers rustling through all the alleys, heard in the very halls of government itself. For the traitor appears not traitor, he speaks in the accents familiar to his victims, and he wears their face and their garments, and he appeals to the baseness that lies deep in the hearts of all men. He rots the soul of a nation, he works secretly and unknown in the night to undermine the pillars of a city, he infects the body politic so that it can no longer resist. A murderer is less to be feared." The only thing Cicero didn't say relating to similarities between ancient and modern politics is "And the population votes for the traitors, enabling them to continue the treason." Unfortunately, the deliberate dumbing down and creation of moral chaos in America has created a shortage of 21st Century Ciceros who could warn the American people regarding the present merger of the United States with Russia (former Soviet Union). " This betrayal has been carried out by our elected and unelected officials, including "phony conservatives in high places". These are the people Cicero refers to who "rot the soul of our nation, working secretly and unknown in the night to undermine the pillars of our cities, and infecting our body politic so that we can no longer resist." Are two ex-KGB Generals (Chiefs) working as consultants in the Office of Information Awareness or any other U.S. government agency in the Bush Administration's so-called "war on terrorism"? After waiting five months for a response I believe it is my duty as a citizen of this country to expose my Senator's dereliction of duty, and I call on the reader to request the same information of his elected officials and to get back to me with whatever response he receives. The evidence of conspiracy is everywhere, but is never mentioned by the controlled major media or educational institutions. The inability of the average American to accept "conspiracy theory" is a result of the media's constant denial, over many, many years of the important place of conspiracy in world history and its constant labeling of those intelligent and well-informed Americans who discuss the role of conspiracy in history as "right wing extremist kooks." Americans unfortunately believe and are conditioned by what they hear over and over on the "controlled" establishment news. That is why I personally make it very clear whenever I speak on radio that "Yes, our nation has been subjected to a vast conspiracy, and anyone who believes otherwise has obviously not cracked a non-revisionist history book." Probably the one key historical event which proves without a doubt the conspiratorial goal of the "traitors" to merge our country into an unconstitutional international socialist system (called for by Lenin and Stalin, with the financial backing of Wall Street, the U.S. Chamber of Commerce, and many multinational corporations) was the meeting Norman Dodd had with Rowan Gaither, the President of the Ford Foundation during Mr. Dodd's tenure as the Research Director for the Reece Committee in 1953. This Congressional committee was established to investigate the activities of the left-leaning foundations. "Mr. Dodd, all of us here at the policy making level of the foundation have at one time or another served in the OSS [the Office of Strategic Services, the forerunner of the CIA] or the European Economic Administration, operating under directives from the White House. We operate under those same directives...The substance of the directives under which we operate is that we shall use our grant making power to so alter life in the United States that we can be comfortably merged with the Soviet Union." Stunned, Dodd finally replied "Why don't you tell the American people what you just told me and you could save the taxpayers thousands of dollars set aside for this investigation?" Gaither responded, "Mr. Dodd, we wouldn't think of doing that." Gaither's response is in itself proof that a conspiracy existed at that time. Subsequent events prove that it continues to exist to this day! (1) gradualism called for by the Fabian socialists, which calls for the making of controversial changes over long periods of time so people don't recognize what is happening; (2) semantic deception (use of traditional-sounding labels to sugar-coat evil intentions and programs); (3) endless supply of taxpayers' hard-earned money; and (4) use of the Hegelian dialectic (the deliberate creation of problems: poverty, wars, depression, etc. to induce concern/panic amongst the population in order to get the public to accept, often at the polls, the pre-determined freedom-destroying sugar-coated solution which it would never have accepted had the problem not been deliberately created. The average voter, after having been heavily conditioned over many years by the media and highly- trained "change agents" in his communities and schools to think and vote a certain way, does so willingly, and walks away from the polls with a smile on his face, not knowing he just lost his wallet or even more important, his constitutionally-guaranteed freedoms. Cicero's "traitors" in and out of Congress, represented by both Republican and Democratic Party leadership, have accomplished their goals without a hitch since the population has been exquisitely dumbed down and conditioned by the education establishment and the "controlled" media to accept these socialist goals as "normal." A few examples, out of many hundreds I could cite, follow, which prove that the American people have been targeted, conditioned and victimized (at an accelerated pace since 9/11) in order to bring this great nation under international control/law, outside of our Constitution and Bill of Rights, thus destroying our political, economic and moral/social foundations and freedom. 1. In 1934 "Conclusions and Recommendations for the Social Studies", funded by the Carnegie Corporation of New York and compiled by the American Historical Association was published. Professor Harold Laski, a philosopher of British socialism, said of this report: "At bottom, and stripped of its carefully neutral phrases, the Report is an educational program for a Socialist America." The Report stated in part: "The Commission could not limit itself to a survey of textbooks, curricula, methods of instruction, and schemes of examination, but was impelled to consider the condition and prospects of the American people as a part of Western Civilization merging into a world order....Cumulative evidence supports the conclusion that in the United States as in other countries, the age of laissez faire in economy and government is closing and a new age of collectivism is emerging...Organized public education in the United States, much more than ever before, is now compelled, if it is to fulfill its social obligations, to adjust its objectives, its curriculum, its methods of instruction, and its administrative procedures to the requirements of the emerging integrated order....If the school is to justify its maintenance and assume its responsibilities, it must recognize the new order and proceed to equip the rising generation to cooperate effectively in the increasingly interdependent society and to live rationally and well within its limitations and possibilities." "The manufacture of armaments (including personal firearms, ed) would be prohibited except for those of agreed types and quantities to be used by the U.N. Peace Force and those required to maintain internal order. All other armaments would be destroyed or converted to peaceful purposes." "The disbanding of all national armed forces and the prohibition of their reestablishment in any form whatsoever other than those required to preserve internal order and for contributions to a United Nations Peace Force." (The U.S. presence in Iraq and elsewhere has nothing to do with national security interests. It is very clearly part of the Act referred to above.) The creation of the Department of Homeland Security, an Agency, is called for in State Department Publication 7277, page 3 when it sets forth objectives which carry out 7277's objectives. The Program also provides for an internal order system (a military government) within the emasculated nation while global control systems are instituted over its "homeland". During this transition period the nation is taken from a position of sovereignty into full blown global government communitarian management." You may ask how such an Act managed to pass and remain the law of the land when we have members of Congress who have taken an oath to support the Constitution of the United States of America? Most shocking of all, in this regard, is the record for all to see of those so-called conservative Republicans who on October 12, 1989, voted in favor of Public Law 101-216, a vote to support P.L. 87-297 (above 1961 Act). This is a clear-cut violation of their oath of office. Elimination of the nation's common defense destroys the sovereignty of the nation and obsoletes its Constitution! Those who voted for the 1989 version of P.L. 87-297 voted to continue financing the giving away of our armed forces to the United Nations. There were 400 yes votes, 11 nay votes and 21 not voting. Please contact Bernadine Smith, Second Amendment Committee at 559-584-5209 or 582-8534 to obtain her informative packet on this subject and to find out if your Congressman voted yes to this give away of our sovereignty. You may be surprised. 3. Presidents Reagan and Gorbachev signed education agreements in 1985 at the same time the Carnegie Corporation of New York signed even more extensive agreements with the Soviet Academy of Science. These agreements accelerated the merger of the two education systems, changing our education system from one focused on academics and individual upward mobility to one focused on quotas for certain jobs requiring work force training (performance/outcomes- based) for a planned international socialist economy. This failed socialist economic system which calls for communist "free trade" as well, is being implemented right now, under our very noses. This failed system is of benefit to a very small percent of the world's population known as "the elite" which benefits from socialist subsidies and the elimination of competition. What we are looking at in the United States today is the redistribution of wealth as well as the redistribution of brains, and nobody, not even a rocket scientist, seems to understand what is going on. 4. The Republican Party invited former Soviet President Gorbachev to be the keynote speaker at a dinner to raise money for Republican candidates. 5. Our government turned over the nation's number one military installation, The Presidio, in San Francisco, California to former Soviet President Gorbachev for his New Age environmental/ecological activities. "During a visit to London in March 23, 2000, former Soviet dictator Mikhail Gorbachev, referred to the emerging European Union (EU) as 'the new European Soviet.' During his address to the German Bundestag last month, President Bush described the EU as a 'house of freedom--its doors open to all of Europe's people, its windows looking out to global challenges beyond.' Mr. Bush discussed at length the EU's role in the accelerating convergence of the United States and the former Soviet Union. 'Another mission we share is to encourage the Russian people to find their future in Europe, and with America,' continued the president. 'A new Russian-American partnership is being forged...A Russian colonel now works on the staff of U.S. Army General Tommy Franks, commander of the war in Afghanistan.' Insisting that 'America and Europe must throw off old suspicions and realize our common interests with Russia,' the President proudly noted that following his summit in Moscow, he and heads of state from other NATO countries would travel to Rome to 'meet as equal partners with President Putin at the creation of the NATO-Russia council. The council gives us an opportunity to build common security against common threats.'" "Putin, the ex-KGB boss, concurred. 'Together, we will counteract global threats and challenges,' Putin said. 'We're going to form a stable world order in the interests of our peoples and our countries.' Dubbed the Treaty of Moscow, the new pact commits Russia and the U.S. to reduce their strategic nuclear arsenals to 2,200 warheads each by December 31, 2002. In addition to the treaty, Bush and Putin signed an eight-page agreement pledging U.S.-Russian cooperation on economic matters, the Middle East peace process, nuclear proliferation and missile defense, and the war against terrorism.'" The average American when confronted with world news that has Putin and Bush embracing one another one year and quarreling/threatening to target one another with missiles the next year, sinks into a state of "cognitive dissonance" whereby he is unable to make sense of anything or to carry on an intelligent conversation about the subject at hand, reacting to one's comment with nothing more than a "glazed expression." This back and forth "planned" agenda is, of course, a brilliant psychological strategy, part of the dialectic, and highly effective in keeping the "sheeple" in line. When, as a result, none of the conditioned "sheeple" utter a peep over such pre and post-9/11 actions, the "traitors" know that it's "safe" to take actions such as naming Henry Kissinger, a Soviet agent, to lead an investigation of 9/11... if ever there was a fox overseeing the hen house! (Please refer to Iserbyt article, "Kissinger Out of the Closet" for documentation regarding Kissinger being a Soviet agent.) Only after a few unconditioned persons had the courage to register complaints over this outrageous appointment, did Kissinger decline the position citing possible conflicts of interest. But the "merger agenda" would continue at an even faster pace. Plans have been in the works since 1997 to bring on board ex-KGB agents to work at the Center for Counterintelligence and Security Studies, http://www.cicentre.com a consulting service in Alexandria, Virginia. The New York Times, in an article dated 8/24/03 entitled "Former Top Russian Spy Pledges Allegiance" stated that the above Center "provides expertise and advice in counterintelligence, counterterrorism and security for the government (repeat government, ed) and companies." "Among Louis Freeh's supposedly commendable achievements as FBI director, according to Robert S. Bennett, (brother of William Bennett, former Secretary of Education, ed) was the realization of his vision of a 'global FBI.' It was in pursuit of that vision that Freeh traveled to Moscow in 1994, and--on the fourth of July--signed a agreement creating a framework for FBI/KGB collaboration. 'We can honestly say that our two nations have more in common than ever before,' declared Freeh at the ceremony, which took place after a tour of the KGB's Lubyanka Square headquarters. 'We are united in purpose and in spirit.'" "A hapless fare-beater was arrested today in the Chambers Street subway station, and he was suddenly surrounded by six Moscow police officers. This was not a scene out of a Cold War nightmare. The Soviets were not taking over the United States. This was a cultural exchange." According to the above-mentioned New York Times article entitled "Former Top Russian Spy Pledges New Allegiance", 8/24/03, Oleg Kalugin, a retired KGB general and son of a member of Stalin's secret police, whom a former CIA chief called 'the smoothest guy I've seen in years' and who is now a new United States citizen, is one of those retired KGB generals working as a consultant at the Centre for Counterintelligence and Security Studies. It was Kalugin, a frequent TV commentator and regular guest on Fox News, who stirred up a hornet's nest last spring by spilling the beans (to an unnamed intelligence agent) on a spy cruise (go to http://www.cicentre.com and click on SpyTrek) regarding his associates, ex-K.G.B. Chiefs Primakov (also former President of Russia and close associate/advisor to Saddam Hussein who visited with Saddam in February of this year, prior to the war in Iraq) and General Alexander Karpov working for recently retired Admiral Poindexter's Office of Information Awareness which is attached to the Defense Advanced Research Project Agency (DARPA), an agency of the U.S. Department of Defense responsible for the development of new technology by the military. This information is covered in detail in an article in the April 2003 issue of Soviet Analyst (www.sovietanalyst.com) entitled "Architect of Soviet Middle East Terror to 'Advise' Washington"...Convergence Acquires New Meaning" by Christopher Story, a highly respected researcher and author with offices in London and New York City. The story was also covered in the May 15, 2003 issue of The Howard Phillips Issues and Strategy Bulletin in an entry entitled "GWB Names Kremlin Spymaster Primakov as Consultant to U.S. Homeland Security Team". Please see Iserbyt's two articles on this subject at www.NewsWithViews.com: "Former KGB Heads to Help Spy on Americans" 4/24/03 and "Former USSR/Russian Premier to Work for Homeland Security" 4/22/03, both of which included information taken from an article in American Free Press entitled "Get Ready for the Sovietization of America", 4/21/03 by Al Martin, www.almartinraw.com, a former intelligence agent. Al Martin's information can also be traced to the same important source, Oleg Kalugin. Only when I was challenged by a NewsWithViews reader to provide more complete documentation for my articles did I go to my Senator from Maine, Olympia Snowe, a liberal Republican, whose ties to the international establishment are very close. My multiple efforts, over a period of five months, to obtain a simple "yes" or "no" answer from Senator Snowe as to whether the Bush Administration had in fact hired these two-ex K.G.B. Chiefs to consult with U.S. officials on the design for an "internal passport" (carte identite) for Americans, were unsuccessful. I have emailed her seven times, called her eight times, and written her (certified mail) once including pertinent articles and documents. I am therefore unable to provide the documentation requested of me. However, I, personally, am assuming that the Kalugin information re Primakov and Karpov is correct since what would Senator Snowe have to lose by telling me the information was not true, if indeed it was not true? She evidently hopes I will go away and that this story will fade into oblivion since the Congress has so-called defunded DARPA's Office of Information Awareness due to concerns on Capitol Hill regarding the constitutionality of sections in The Patriot Act and privacy-invading activities being developed at DARPA's Office of Information Awareness. Don't hold your breath for the cessation of the unconstitutional projects presently under way to track every movement of every single American. The projects have simply been shifted to another unnamed office with an alphabet soup title. Senator Snowe's refusal to answer a constituent is outrageous. Comments from her staff may sound familiar to the reader: "She is out of town; she is very busy; it takes two months for her to receive letters due to the Anthrax scare...you should perhaps email her", which I had done eight times! When trying to reach her staff member who deals with the issue of terrorism, Homeland Security, etc. I was told each time I called that he was in a meeting. When I left a message on voice mail three times and asked to be called back I never received a return call. In order to have additional proof of what I had turned over to her office I taped my last phone message which includes most of the information in this article. I have finally given up calling Senator Snowe's office. Is this what representative government is all about? All questions from constituents are important. However, it seems that questions related to the hiring of very, very important ex-KGB Chiefs to consult on matters of internal and national security are irrelevant to those walking the marble halls of Congress, those who "are undermining the pillars of the city" according to Cicero in 42 B.C. As it presently stands, our elected officials, most of whom support passage of unconstitutional laws and actions, including the Patriot Act, etc. are the equivalent of what Cicero described so well. If they are not traitors, what exactly are they? You may also go to https://www.youtube.com/user/iserbyt3DResearch/videos and watch all 24 videos. No one has an excuse anymore not to know what has happened over past 200 years, and how that relates to what is happening now. This is the tool you need to spread the word of what has been happening in this country for years. We have stalled their efforts by at least 39 years! We MUST continue the opposition/resistance. Future generations (your children!) are counting on us.